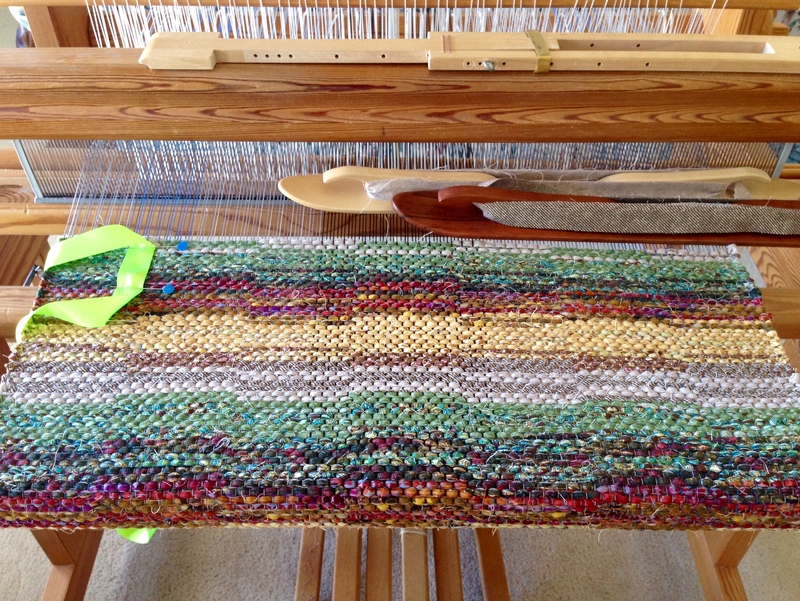 This warp for the double-width wool blanket is taking some down time while I complete a finishing sample. The five-fold purpose of the sample is to 1) check the sett and 2) the weft density, and 3) to examine the fold to see if I need more, or less, weft at the turn, and 4) to test the wet-finishing process, and 5) to see the effect of brushing the finished piece. I am thankful for family, friends, fellowship, and finishing. 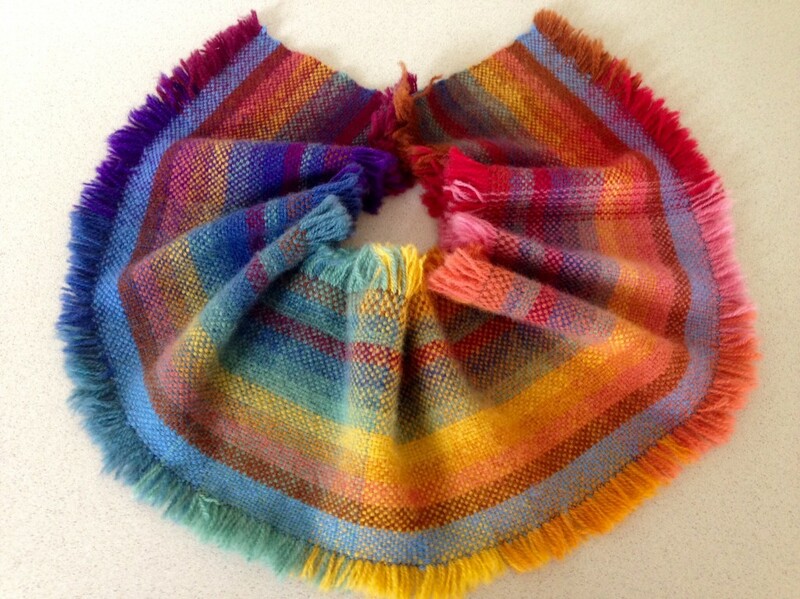 (Thankful for blog friend Marie for first suggesting a finish sample.) I hope you, friend, get to have time with the ones you love, and have some down time to enjoy. Happy Thanksgiving! Sample piece is cut from the loom. 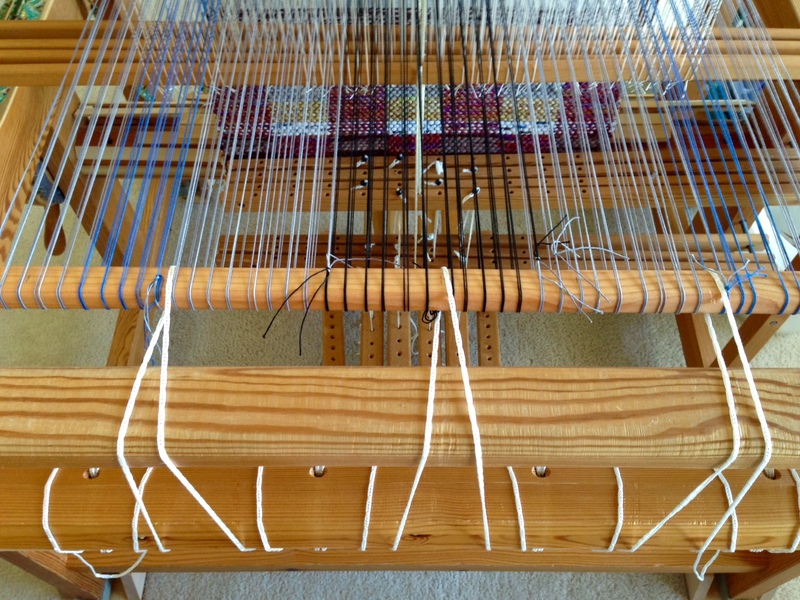 Warp will be tied back on to the front tie-on bar. 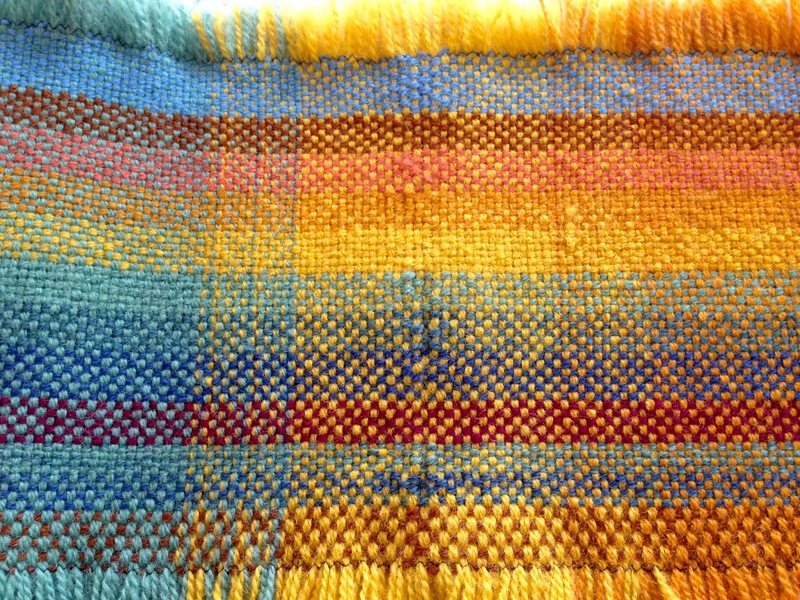 One half of the double-width blanket sample. The fold is at the yellow. Other side of the double-width sample. The fold is at the yellow. Blanket fold revealed. 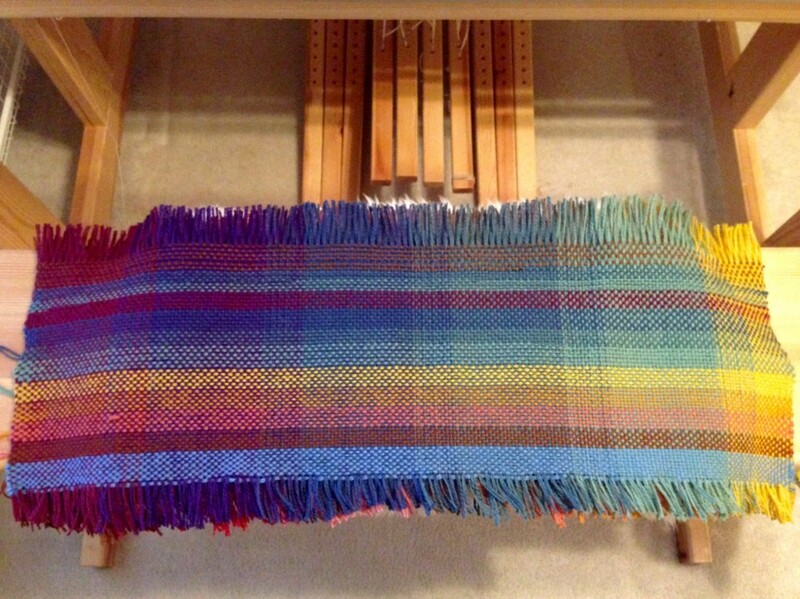 Weaving double width means you only see one half until it is cut from the loom. Wet Finishing. Sample has been washed and dried. Washed on delicate cycle in washing machine for 3 minutes, no spin cycle. Air dried flat. Examining the fold after wet finishing. 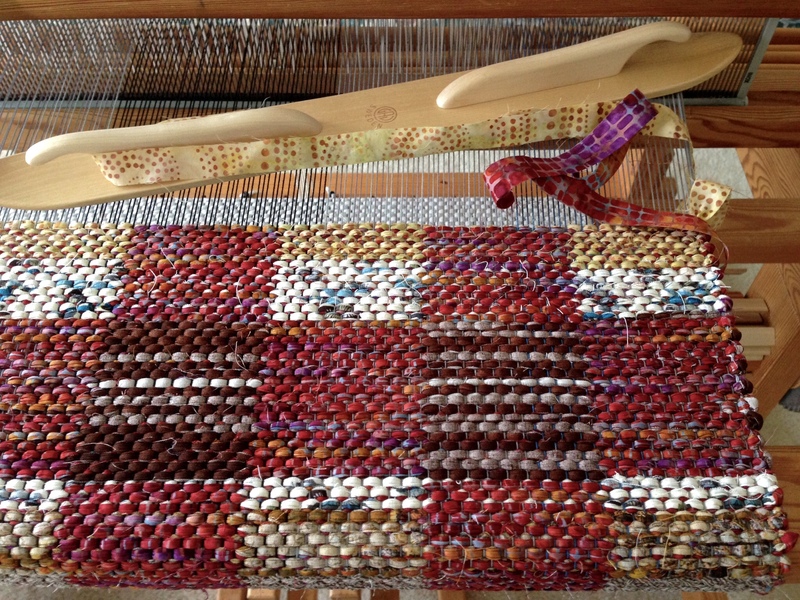 Also, notice the improved weft density in the final segment (brown weft at the bottom), when I applied a lighter beat. Blanket sample brushed on one side, using a stiff dog brush. Compare the brushed top side on the left to the unbrushed bottom side on the right. Brushed double weave finishing sample. Hmm… Could this be my new Christmas tree skirt? May your family and friends experience your thankfulness. Love the colors, looks great. Thanks for sharing your progress. I love the brushed. 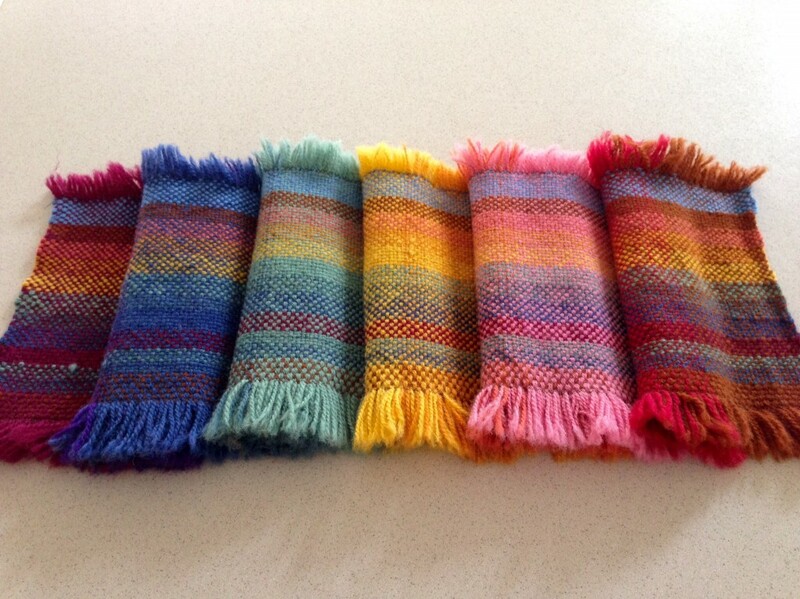 Have you decided which color weft yet? So many choices! I like the way the brushed looks and feels, too. 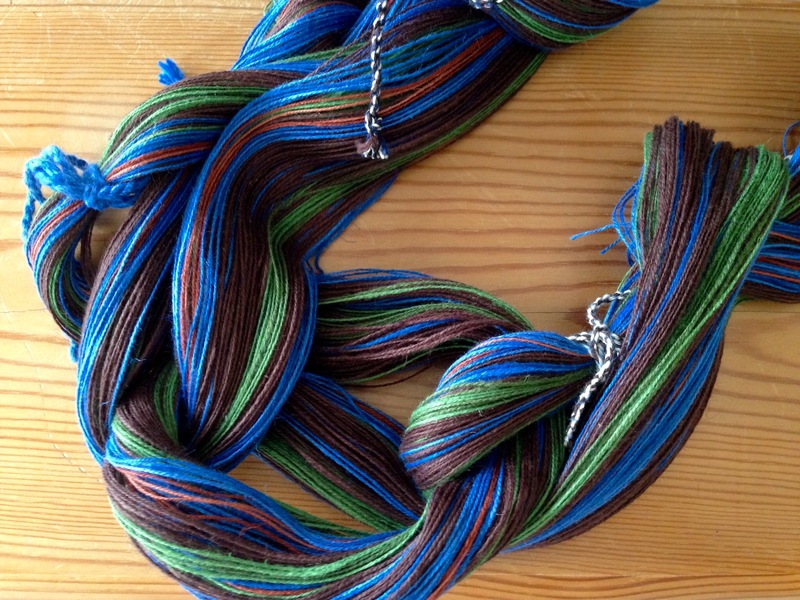 I have chosen the weft and already have it in hand. You’ll see it when I get this going again, possibly as soon as next week. Looking forward to watching your progress on this project. It’s going to be fun! Isn’t it amazing how many different things you can try on one tie-up? All you need is color, time, and a craving to learn. 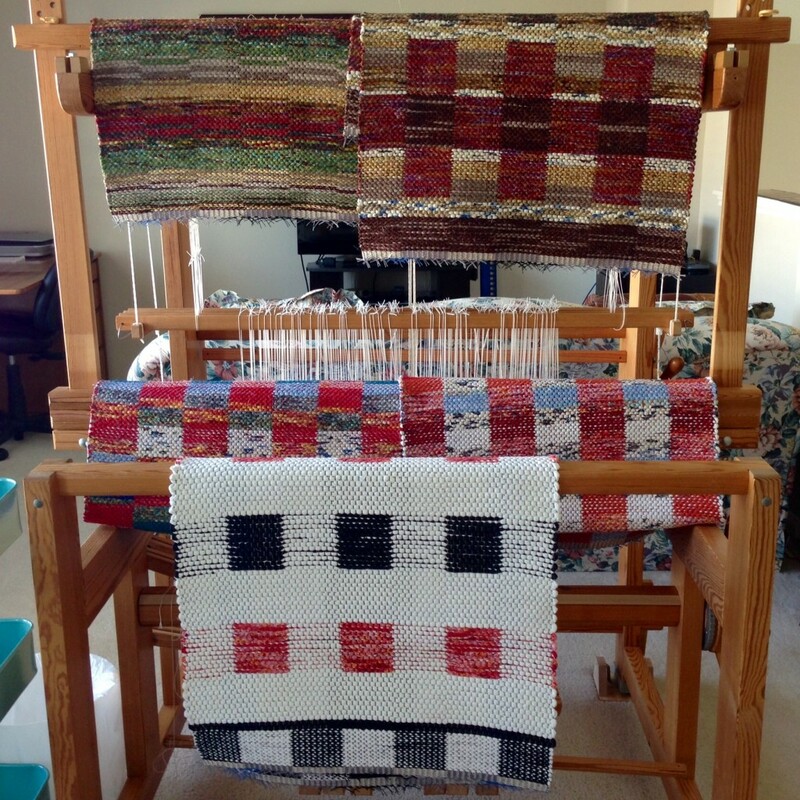 It has been exciting to try some fresh ideas for double binding rugs. Now I have new patterned rag rugs, ready to hem! 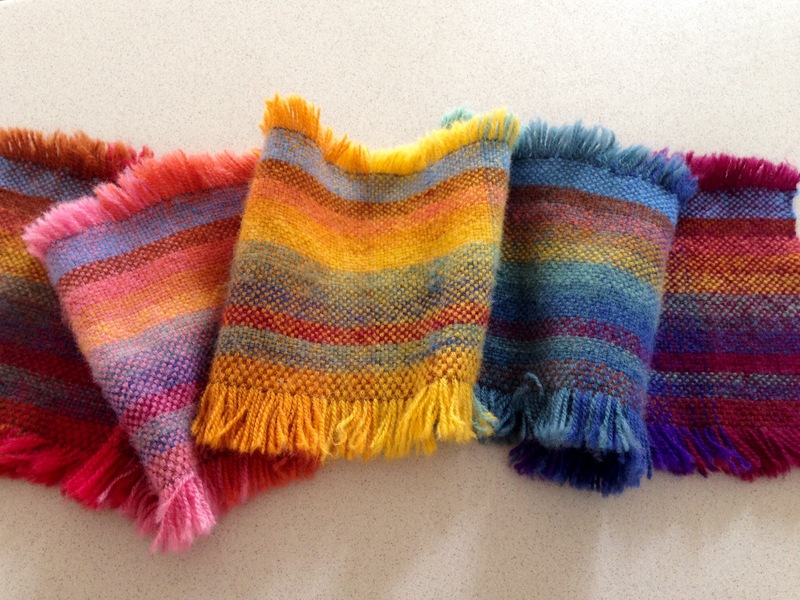 Variety of rag rugs from one tie-up. Lessons abound in life. There are amazing things to learn with the Lord by your side. Jesus is friend and coach. He governs and carries. The diverse and satisfying results are woven into your life experiences. May you see positive results. PS The rugs are now hemmed. One rug has been sold, and two of the rugs are in my Etsy shop. I have new warp excitement! 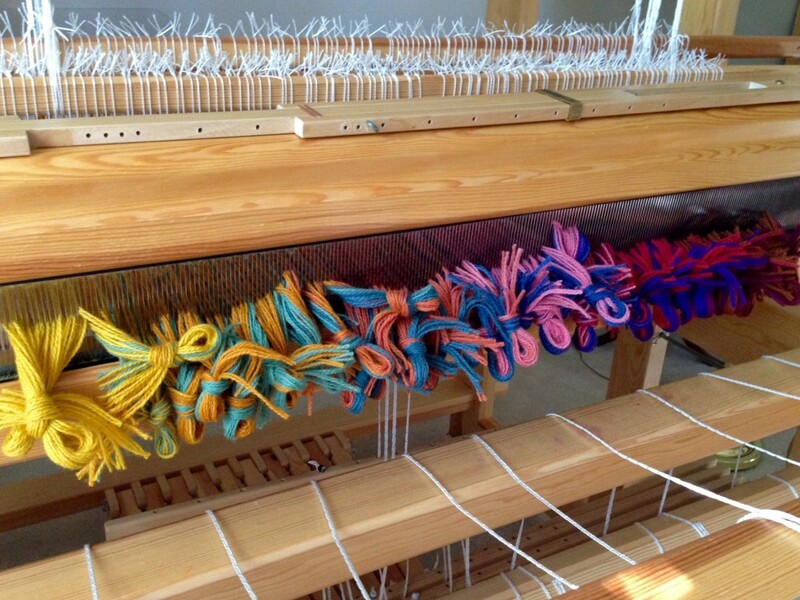 Having a new warp chain ready for the loom is much like coming into a season of gift giving. Every step of dressing the loom is like meticulously wrapping the gift, with some things completely hidden away. 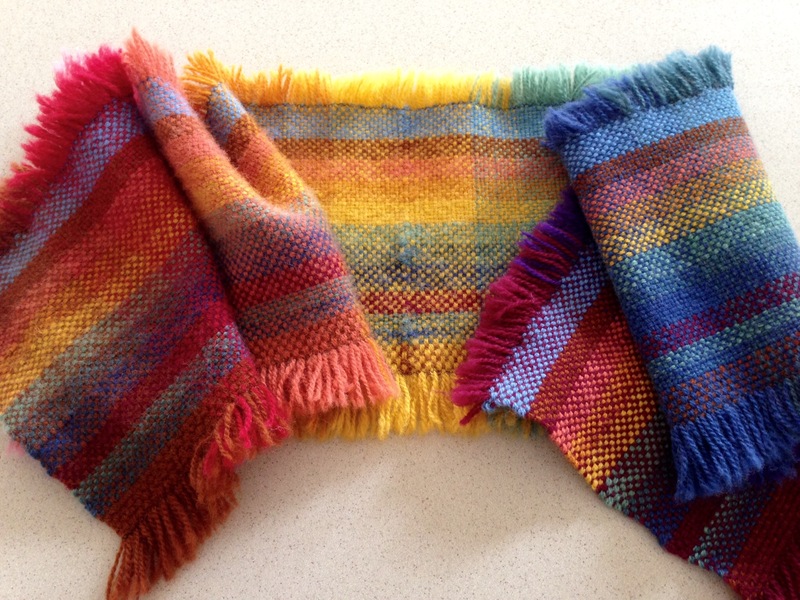 When the weaving begins, the gift is opened, little by little. The final unwrapping happens when the warp is cut from the loom, and all the delights are fully revealed. Cottolin warp chain ready for dressing the loom. Spreading the warp by pre-sleying the reed. Spread warp is ready to be beamed on. Peace, grace, hope, and love. These are the gifts I wish for you, friend. These gifts are ready to be unwrapped! Watch the fabric develop before your eyes as you weave, and enjoy the wonder of opening the gifts. May you receive gifts that are better than you expected. Thats exactly how I feel about weaving! Thanks. It’s great to share that common experience! I agree about learning! 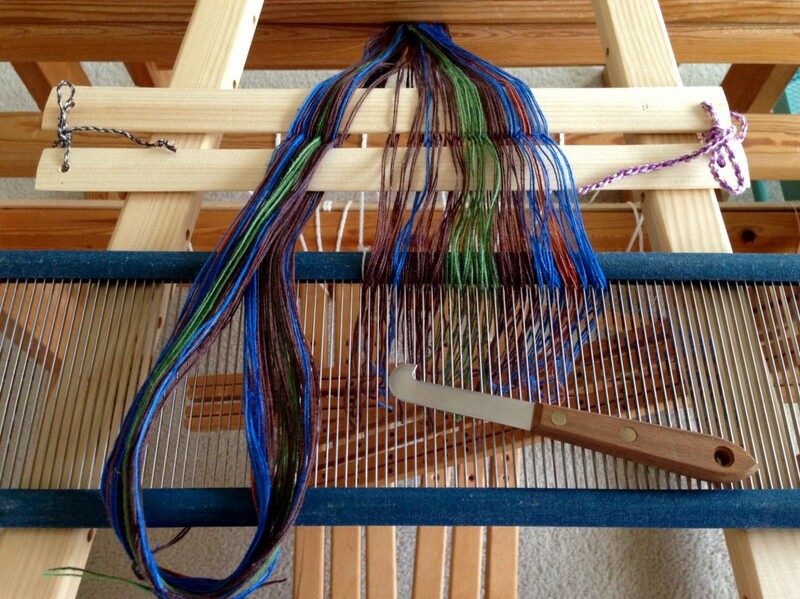 That’s one of the things I love about weaving. There’s always new things to learn. I call this back to front warping, too. How do you spread the warp? That’s a nice-looking sleying hook. Is the handle comfortable? Where did you get it? I love your blog! Thank you for writing it. The handle of the sley hook fits nicely in my hand. It has a very nice weight balance, which makes it comfortable to use. I purchased it from Vavstuga.com. I’m glad to hear you enjoy the blog. I write it for friends like you. Can I Cut it Off Now? 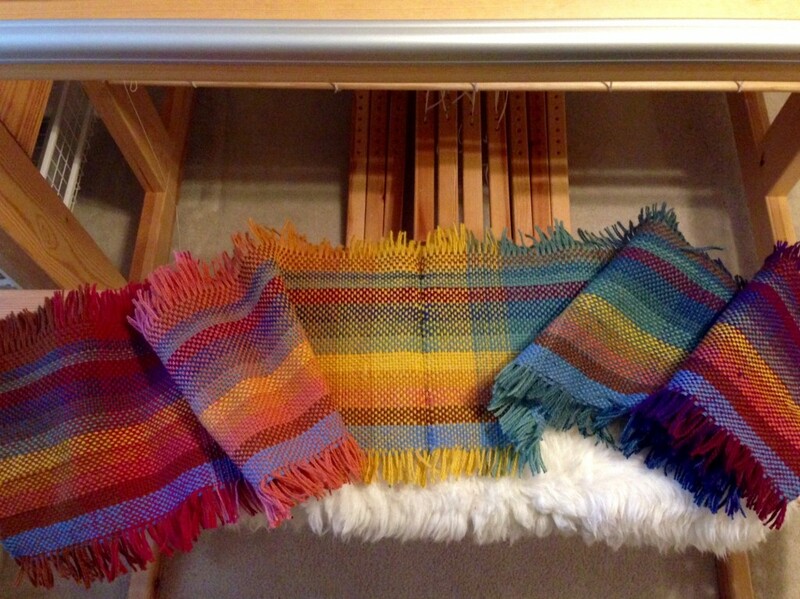 Four rugs woven, with hardly enough warp left to weave anything worthwhile. I am eager to cut off the planned and finished rugs, and move on to the next thing. There is only a short span of warp left, so why waste time weaving a runt-sized rug? It won’t hurt to cut it off now. I am not losing that much of the warp. 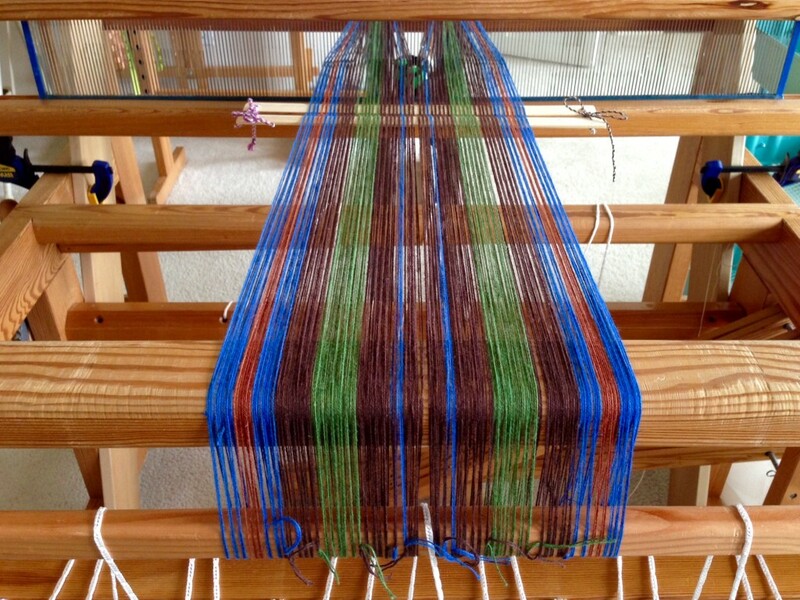 When the back tie-on bar comes up over the back beam, you know you are at the end of the warp. 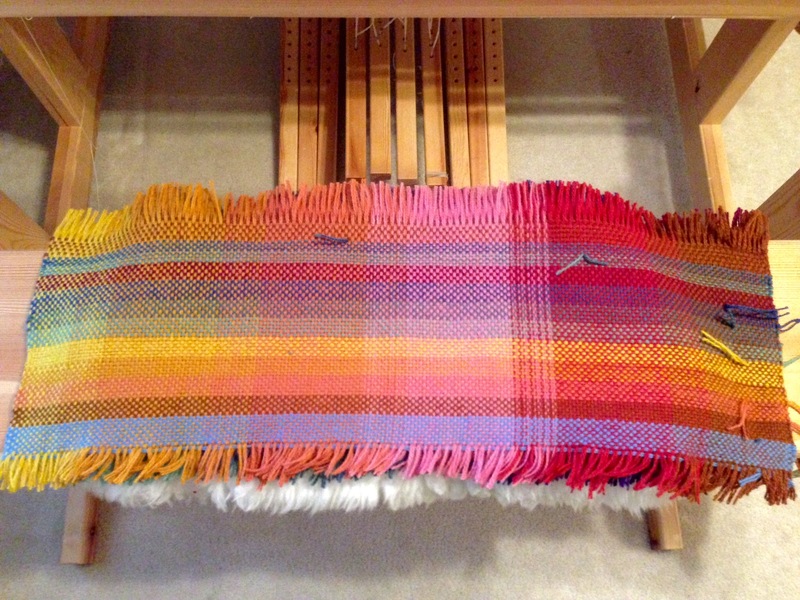 I have heard that there is a saying in Sweden that when the end of the warp comes over the back beam you must complete the remainder of the weaving in one sitting. All I have left are scraps–fabric strips that were cut for previous rug designs. …Wait a minute… Could this be an opportunity in disguise? A chance try out another design idea, using fabric strips that are already cut? If I think of this as a welcome challenge, instead of a waste of time, I start seeing everything differently. Design limitations help expand creative ideas. 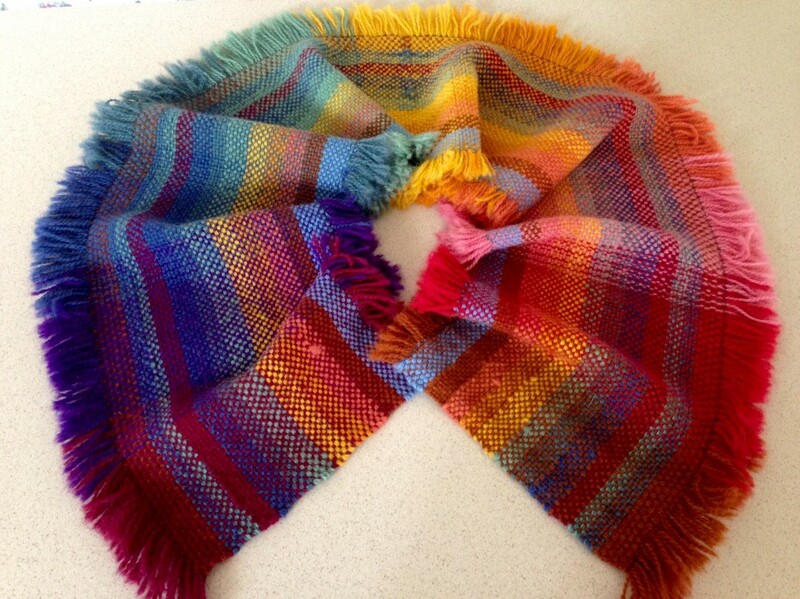 This piece uses only fabric leftovers from previous rugs, and is limited to about 26 inches / 66 cm of warp. The natural progression of a negative thought goes from bad to worse. Unless something intervenes to stop the progression, it can end in results far worse than cutting off a rug warp too soon. Giving thanks to God breaks the negative progression, and opens us up to an unseen world. A world of beauty and purpose. A place where scraps are used to make new and beautiful things. And where using the rest of the warp is never seen as wasted time. May your Thanks-giving celebration begin early and continue far beyond the norm. Looks like a terrific bench pad to me! Great idea, Joanna! I’ll keep that in mind. The cloth beam is filling up with rugs. The fuller the cloth beam gets, the more muscle it takes for me to crank up the warp tension. I put all my weight into it. Literally. First, I agressively turn the wheel at the back beam to tighten the ratchet. Then, I grab two spokes of the breast beam‘s wheel, put a knee or foot on another spoke, and pull back with all my might, adding an appropriate grunt! Because of tight warp tension, it is possible to firmly pull the weft around the selvedge ends, creating snug edges on the sides of the rug. Why keep the tension so extremely tight? Because of the outcome–good rugs. Rugs that are sturdy, have snug selvedges, and lay completely flat. Hopefully, my effort will outlast me, as the rugs continue to serve people long after I’m gone. It takes tremendous effort to hold on to courage when hope is slipping. After cranking up the tension for so long, the thought of keeping it up becomes overwhelming. One word of en-courage-ment from a friend breaks through hopelessness: God will see you through. Hope is restored, not based on feelings or positive thoughts, but based on believing God. Keep up your courage. Only a few more turns and you’ll be there. The rugs will be finished; and you will know you did what you were called to do. Keep up your courage, friend. May your good efforts outlast you. Thank you! This has become my favorite double binding pattern.